Naming Rights Sprint Communications will pay approximately $62.5 Million over 25 years. Downtown Kansas City is now home to one of the finest arenas in the country. Opened on Oct. 10, the $276 million Sprint Center is a state-of-the-art, 18,500-seat arena on the eastern edge of the Power & Light District. Elton John opened the arena with a special performance on Oct. 13. Kansas City's new home for major concerts, sporting events and family shows, Sprint Center is the cornerstone in the revitalization of downtown Kansas City that in addition to the arena will feature condominiums, restaurants, themed bars, movie and live entertainment theaters and mixed retail. The facility also houses the College Basketball Experience - a 41,500-square-foot building that features the National Collegiate Basketball Hall of Fame as well as an interactive fan area. The hands-on, high-energy exhibits place visitors in electrifying game-like situations. The arena complex comprises eight-and-a-half acres, bound by 13th Street to the north, Truman Road to the south, Oak Street to the east and Grand Boulevard to the west. Sprint Center is a public/private partnership between the City of Kansas City and AEG, a world industry leader in entertainment and sporting ventures. AEG operates some of the world's finest arenas, from Los Angeles' STAPLES Center to London's new world-class arena, The O2. Sprint Center will host more than 90 public events throughout the year and features smaller rooms for private meetings, seminars, receptions, charity functions, graduations and other special events. Nearly one million guests are expected to visit Sprint Center in its inaugural year. Uniondale, N.Y. - The New York Islanders' plan to play an exhibition game in Kansas City is raising speculation that the team may be testing the waters for a move. Representatives for team owner Charles Wang said there's no plan to move the team, which reportedly loses more than $20 million a year. And the developers who, along with Wang, have proposed a massive project around a renovated Nassau Coliseum said that whether the team stays or goes isn't their concern. They're forging ahead with the Lighthouse Project, which proposes 300 hotel rooms, 200,000 square feet of convention space, 1 million square feet of office space and 2,300 luxury apartments. Hempstead Town officials said the Lighthouse Project is much bigger than hockey. "We met with the [Lighthouse group] as recently as last week," Hempstead supervisor Kate Murray said. "If the Lighthouse Project were only about hockey and the Coliseum," she said, "the process would move much more quickly because you'd be talking about a renovation project instead of an enormous new development project - probably the largest in decades." The president of the Lighthouse Development Group, Michael Picker, said he anticipates that state-required environmental studies of the project will be completed in the next 30 to 60 days. It was in February 2003 that Wang first discussed plans to renovate the Coliseum with Nassau County Executive Thomas Suozzi, Lighthouse officials said. But it wasn't until November 2007 that Wang and real estate mogul Scott Rechler submitted a detailed plan to the Town of Hempstead to build the 150-acre project. In April, the team submitted an eight-page draft report outlining environmental studies under way. Two public hearings were held in May and, since then, Lighthouse officials have been meeting regularly with town officials and a town engineering consultant to develop ways to mitigate effects on the environment. Wang is losing $20 million or more per season in the current facility, according to the Islanders. The decision to test the waters in Kansas City - where the Sprint Center is operated by AEG, which also owns the Los Angeles Kings - appears to be a sign of Wang's growing impatience. Islanders general manager Garth Snow described it as a "hockey operations decision," but it wouldn't happen without Wang's approval. "I've always been encouraged to find ways to expand our fan base," Snow said. "This is probably a hot-button topic because of the decision to play the game in Kansas City. But I'm being consistent in the way I've scheduled preseason games in the past. It's a good opportunity to touch fans in a different market." The Islanders' lease runs through 2015, but more importantly, they hoped to break ground this summer on their new arena as part of the Lighthouse Project. But as each day passes without any movement, that potential ground-breaking date seems all the more unlikely. Kansas City, Mo. 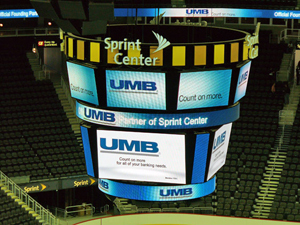 - Strong profits from the Sprint Center will add $1.8 million to Kansas City's budget. The city's lease with operator AEG says once the building turns a 16 percent profit, the city gets half of the additional amount. "When it comes to visitors, concerts and gross revenue, the building, from that standpoint, is an overwhelming success," said Tim Leiweke, president of AEG. AEG had not anticipated that the profit-sharing agreement with the city would kick in for several years, if at all. "That was a throwaway provision," Leiweke said. "Our lawyers said give in on it because we never thought we'd get to that figure." Leiweke said the strong, concert-fueled profits at the arena during the fiscal year that ended July 31 means AEG can be more selective about pursuing an NHL or NBA franchise for the facility. Any professional team would likely demand big chunks of the facility's revenues from luxury suites, concessions and sponsorships. That would cut the arena's ultimate profits. "It's a tougher scenario with a professional team," he added. If there were a team there now, "I'm sure we wouldn't be able to write a check to the city for $1.8 million." While landing a professional sports team as an anchor for the arena remains the ultimate goal for AEG, Leiweke said the presence of a team also could diminish its popularity as a concert venue. Now, the arena has an abundance of options to offer concert promoters. The team's games at the arena would remove up to 50 dates from the calendar and also would likely put much of May and June on hold because of potential playoffs, Leiweke said. The venue hosted a preseason NHL match this week between the Los Angeles Kings, owned by AEG, and the New York Islanders. The match drew fewer than 10,000 fans. The city-owned arena was financed with revenues from increases to car-rental and hotel-room fees approved by city voters in 2004. Leiweke said those fees have generated $19 million more than budgeted over the past two years to repay the bonds issued for the $276 million arena. In return for investing $54 million in the project, AEG has a 35-year deal to operate the facility. Under the operating agreement, AEG also would be responsible for any losses. Kansas City, Mo. - The Power & Light District, built to bring crowds downtown, will require a long-term $10 million to $15 million annual subsidy, according to new city projections described in the Kansas City Star. When the city in 2006 approved issuing $295 million in bonds for the downtown entertainment project, it was conceived as a self-sustaining venture, the newspaper said. But a delayed opening, the economic downturn and higher-than-expected borrowing costs have meant that so far it has not generated enough revenue to cover debt payments. "It will probably never fully cover itself," acting City Manager Troy Schulte told The Star. "We've built into all of our long-term projections the assumption of a $10 million to $15 million annual debt subsidy." Given Schulte's estimate, to subsidize the district, developed by the Cordish Co. of Baltimore, city taxpayers would have to pay at least an extra $230 million by the time the bonds are due in 2033, The Star said. Schulte said the subsidy would be built into future budgets, and he and City Councilwoman Deb Hermann told the newspaper that the project, which replaced acres of urban blight, was still a good investment for downtown. The chief architects of the redevelopment plan, former Mayor Kay Barnes and former City Manager Wayne Cauthen, continue to support the project and are skeptical about the city's new assumption. "I would not assume that situation will continue into the future," Barnes told The Star. "Five or 10 years out, it may look very different and much closer to the earlier projections." And the Cordish executive in charge of the district said the company remains bullish on the project. Schulte, who was not involved in the original Cordish negotiations, believes taxpayers still should be pleased with the investment, the newspaper said. He told The Star much of the money went toward rebuilding crumbling downtown sewers and streets, and the project has greatly improved downtown's reputation. "20-20 hindsight is always good, but I'd tell taxpayers to come down and enjoy downtown, because you're paying for it," he said. Cauthen, who's back in Colorado after losing the city manager job in November, told the newspaper that he was surprised that his successors at City Hall were calculating such dismal long-term financial returns. "No disrespect to these guys, but I think it would be prudent to speak to the people who put the expectations together," Cauthen said. 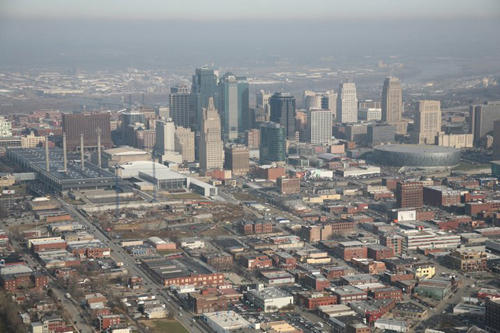 The former city manager said the arrival of a professional franchise at the Sprint Center, the opening of the Kauffman Center for the Performing Arts, a potential new convention hotel and several other unknown variables could mean more business at the Power & Light District and more revenues for the city. The 511,000 square feet of retail space in the Power & Light District is now about 75 percent occupied, according to the city. Rob Hunden, the Chicago consultant who prepared the revenue projections the city based its assumptions on in 2005, told The Star that he believes that big factors in the shortfall were the delayed opening and continuing vacancies. The report by C.H. Johnson Consulting assumed that the development would be fully operational with 90 percent occupancy by March 2007 and that it would generate $17.7 million in sales-related tax revenues its first year. Instead, the first two businesses didn't open until November 2007, and only about a dozen were open by spring 2008, the newspaper said. "The primary assumption going into the analysis was that it would lease up and be completed in the time we estimated, and neither of those things happened," Hunden said. "The tenants who have opened have performed as projected; the problem is, not enough tenants have opened." The Star said city officials are not blaming Cordish for missing the financial projections. They assign the blame to the weak economy, higher-than-expected infrastructure costs and higher-than-expected borrowing costs, again, a factor of the national downturn. "The deficit is not the result of Cordish," Schulte said. "They continue to open more retail and restaurants in one of the worst economic conditions the city has ever faced. "We simply built too much infrastructure on an uncertain revenue stream and optimistic assumptions about the global credit markets." Cordish estimated $212 million out of the $295 million in bond proceeds went toward rebuilding the infrastructure in the Power & Light development area. That figure, however, includes two city-owned underground parking garages specifically serving the project, the newspaper said. Nick Benjamin, executive director of the Power & Light District, said in a statement to The Star that the project has generated far more tax revenues for the city than have been captured within the development itself for the purpose of repaying the bonds. "If one includes all the incremental tax benefits that have accrued to the city from the decision to build the district ... the Power & Light District is covering not only its own costs, but those of the rebuilt city infrastructure as well," the newspaper reported. The continuing subsidy should not require any future cuts in the city budget because, Schulte said, funding has been built into future budget calculations. Still, the subsidy subtracts from money that could be spent on other city needs. Kansas City, Mo. - Kansas City officials say they are happy with the performance of the Sprint Center and aren't worried that a hoped-for pro sports franchise has not taken up residence in the building, according to the Kansas City Star. 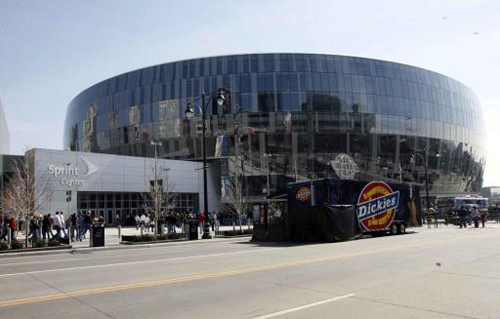 Language in the contract between the city and building operator AEG states that if a team isn't found by October 2010, the city could take back AEG's exclusive rights to seek a major tenant for the Sprint Center. It also states the city could use arena revenues to pay for its efforts. But concerns have changed in three years. Now some wonder whether a major tenant is even needed to make the arena work, the newspaper reported. The Star said City leaders made clear they're not interested in taking anything from AEG. No city official is pushing to invoke the contract language and take away AEG's negotiation rights, confirmed Herb Kohn, the Kansas City attorney who assisted the city in negotiating the Sprint deal with AEG. "Frankly, if AEG can't get a team, who can?" Kohn told the Star. Kevin Gray, president of the Kansas City Sports Commission, told the newspaper further study is needed to go into whether Kansas City could support another major franchise. But if Kansas City pushes for one, he said, "we have absolutely the right group involved in this, that's AEG." Mayor Mark Funkhouser thinks AEG should continue to pursue an anchor tenant. The mayor said an anchor tenant would increase crowds at the nearby Power & Light District, and that could in turn reduce the $10 million to $15 million annual city subsidy to cover the district's debt. Last year, the Sprint Center provided $1.8 million to the city from its arena operations, which now have attracted more than 350 events in three years and more than 3.7 million spectators, the newspaper reported. Oscar McGaskey, executive director of Kansas City's convention and entertainment facilities, told the Star AEG was on track to provide another $1.8 million payment to the city this year. The profit-sharing is part of the city's agreement with AEG and kicks in when Sprint Center exceeds a 16 percent annual profit. Kansas City, Mo. - In its third year of operation, the Sprint Center will pay $2.1 million to Kansas City as part of a profit-sharing deal struck when the building was developed, according to the Kansas City Star. The arena is owned by the city and operated by Anschutz Entertainment Group of Los Angeles. As part of its agreement with the city, AEG splits half the profits with the city once the firm turns a 16 percent profit at the building. "We couldn't be more proud of our successful partnership with the city of Kansas City and the world-class reputation that Sprint Center has come to stand for," Timothy J. Leiweke, president and CEO of AEG, said in a statement. Acting city manager Troy Schulte told the Star the city had budgeted receiving $1.8 million from the Sprint Center profit-sharing agreement, with the money dedicated toward subsidizing losses at Kemper Arena and the American Royal complex. "It's a $300,000 help, which will probably be applied to convention center needs and capital needs," he said. Pollstar magazine ranked the arena's third-quarter attendance as second best in the United States and seventh in the world. The second-place ranking is the highest attained by the Sprint Center since its opening. The trade publication ranks facilities by live entertainment box office receipts and does not include revenue from sports franchises. The American Royal is considering moving its dirt events out of Kemper Arena and into the Sprint Center, Kansas City Star columnist Mike Hendricks reported. Explaining the move in a letter to the Royal board of governors, current chairman David M. Fowler said the American Royal is not tied to a set of buildings but instead is "a virtual organization representing all that is agrarian in the Kansas City Region." As evidence of that, he wrote, "we will take our activities to other venues." Hendricks said a final agreement is expected soon. All three interested parties forecast a big boost in overall attendance, even though the rodeo and the concerts that follow it would be compressed into one three-day weekend, instead of two. The American Royal Rodeo will move from Kemper Arena to downtown Kansas City this October, the American Royal Association told the Kansas City Star. The association said it will hold its 2011 Professional Rodeo Cowboys Association Gold Tour Rodeo on Oct. 27-29 at the Sprint Center. AEG President Tim Leiweke told the Kansas City Star that the company intends to be picky about any NBA or NHL team it invites to play at the Sprint Center. "Kansas City can take its time," said Leiweke, whose company manages the Sprint Center, where an announced crowd of 17,779 saw the Pittsburgh Penguins beat the Los Angeles Kings 3-2 in an overtime shootout. "The key is you can chase a team, but you're going to end up not making a great deal and maybe being disappointed. Or you can wait and not only try to find the right situation, but economically make the right deal. ... Right now there is not an urgency," Leiweke said. "This building is doing phenomenal. When we began this process, if we would have known this building could stand on its own two feet and be one of the top five buildings (for concerts and family shows) without an anchor tenant, we would have been going around telling people, 'If there is an anchor tenant that makes sense, we'll get it, but we don't need it.' We're fine without one, and we probably make more money without one. And the city makes more money without one. That said, if we can make the right deal and find the right team, I definitely think that's what we have to do here." Kansas City, Mo. - After a one-year tryout at the Sprint Center in 2011, the Kansas City Star said the American Royal Rodeo is headed back to the West Bottoms this fall. But not to aging Kemper Arena, its home for four decades. Instead this year's event will be in far smaller Hale Arena. Instead of the 18,000 seats at Kemper Arena, it will play before fewer than 3,000 at Hale. Gone too will be the concerts by big-name musical performers such as last year's main headliner, Reba McEntire, who drew more than 10,000 of the 17,870 people who attended the four rodeo performances at the Sprint Center. Instead, local and regional bands, yet to be named, will play before and after the bronco busting and calf roping this year. The newspaper said to some, this might seem like both a major retrenchment by the organization and further bad news for Kemper's sinking fortunes. Yet American Royal officials deny the first contention even as they and others concede the latter about Kemper's slide. "We really think a rodeo fits best in the West Bottoms," American Royal President Bob Petersen said, but that wasn't the only reason for the switch. "It was really just a confluence of factors." Although American Royal officials claimed the Sprint Center event last year was "the best rodeo Kansas City has ever seen," scheduling and logistical issues came into play this year. One of the biggest impediments was a conflict over dates at the Sprint Center that forced the American Royal to look for other options. "I think they were kind of up against the wall," said Oscar McGaskey, director of the city convention and entertainment facilities. For many years, the rodeo has been held in late October, but that wouldn't have been possible in 2012, Sprint Center general manager Brenda Tinnen said. "The Red Hot Chili Peppers have had that date (Oct. 27) on hold for quite a while," she said. Madonna arrives a few days later. Another consideration is the rodeo calendar. For as far back as officials of the horse and livestock organization can remember, the American Royal was one of the last big rodeos of the season before the national finals in Las Vegas. Then in 2007, the finals were pushed back a month, making the American Royal less attractive to the sport's biggest stars. The move to the Sprint Center was one attempt to boost the rodeo's prominence once again. But that, too, produced mixed results. While McIntyre drew a big but less-than-a-sellout crowd Saturday night, the Saturday matinee and Thursday and Friday evening concerts by Pat Green and Lynyrd Skynyrd were sparsely attended. "We didn't meet expectations," Petersen said at the time. Rodeo performers weren't entirely pleased, either, with parking their trailers downtown and having to shuttle back and forth between the Sprint Center and events in the West Bottoms. "So all things being equal, we decided to bring it back home," Royal Chairman Brant Laue said. The rodeo is now planned for Sept. 27-29, which will once again make Kansas City the last major stop on the rodeo circuit before the finals. Another hope is the date change will create more public interest by compressing events. The American Royal parade downtown is also set for that weekend, while the Royal's World Series of Barbecue is set for the weekend after that. The American Royal still uses city-owned Kemper for some of its horse shows, but only because of the need for more floor space than Hale Arena has. What the organization would prefer, instead, is to knock down Kemper and replace it with a 5,000-seat equestrian center that would suit its needs.